We all need hope. Whether we’ve just lost our cool when a child shatters glass on the kitchen floor or our lives have been completely shattered from the death of a loved one, Jesus Christ reminds us that there is always hope for a better day. He is our anchor through the storms of life. The stories and reflections in Choose Hope are based on scripture readings from the liturgical calendar of the Catholic Church but the writers are from diverse Christian backgrounds, each adding a unique beauty to the mosaic that the authors form. Join me on this scriptural, devotional journey as we reflect on the challenges we face in the mundanity of the everyday and in the profundity of the life-altering events here on earth. 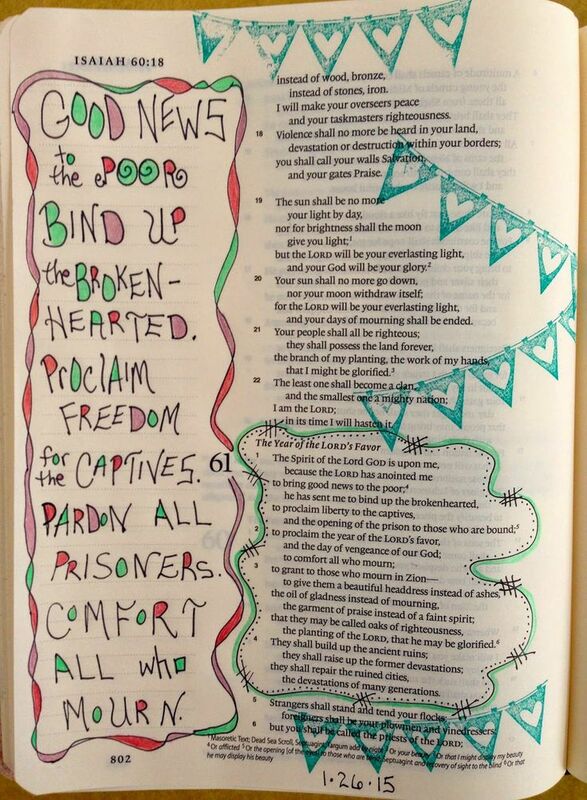 We pray this book finds a home in many hearts. That the words of our contributors will enkindle a deep confidence in the work of Almighty God in our lives. Come, Holy Spirit, renew the face of the earth with hope! God bless you and thank you for your support. Pre-Orders begin Thursday, November 1. Click here to pre-order Choose Hope. World Autism Awareness Day is Saturday, April 2. To hear the special podcast of “Good Things Radio” dedicated to this theme, click here. 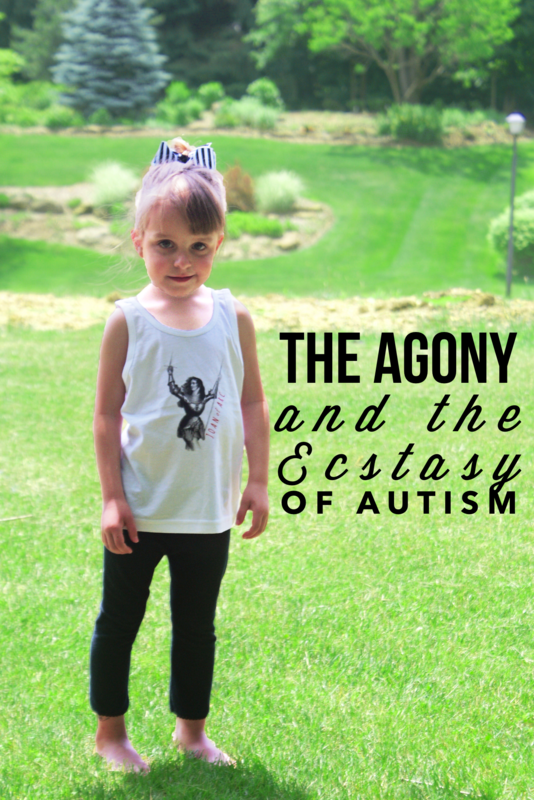 Autism affects 70 million people, globally. Each person is different. I do not seek to speak for anyone else. But since our family is counted among that number, I do want to take a minute and share something I wrote about our journey. It is a tribute to my daughter, Karolina. If even one person finds this and feels a sense of solidarity in these words, I thank God for that. You are not alone. May we be a people of the Beatitudes, and celebrate the saints in our midst. The secrets of the universe you hold in your mind. Yet words to voice your wisdom you’ve been unable to find. You live in a world of silence, and so often I feel left out. I long to connect with you. In desperation, I want to shout. The days you scream in endless frustration for reasons I can’t find. This is the agony that makes me nearly lose my mind. Lord, how can I do justice to a child such as this? When she cannot tell me what she needs, and every hug she will dismiss? And the dreams of a miracle slowly start to fade. Something holy, and powerful beyond this world and me. That comes from within you, to serenade the night. If you can do it, I know I can too. My precious sinless child, I pray to be more like you. An understanding of the cross with breathtaking magnitude. And autism is such a perfect disguise. God chose the weak things of the world to shame the strong. And in you, I’ve seen this hidden strength all along. You are the North Star that points to heaven to help make me whole. Because on the canvas of their lives, we see the promise of heaven God paints. The USCCB has declared November 15-21 National Bible Week, in celebration of the 50th Anniversary of the Second Vatican Council Dogmatic Constitution on Divine Revelation, Dei Verbum. This year’s theme is “A Book for the Family.” Any time is the perfect time to study sacred Scripture but I am especially thankful for the opportunity this week. 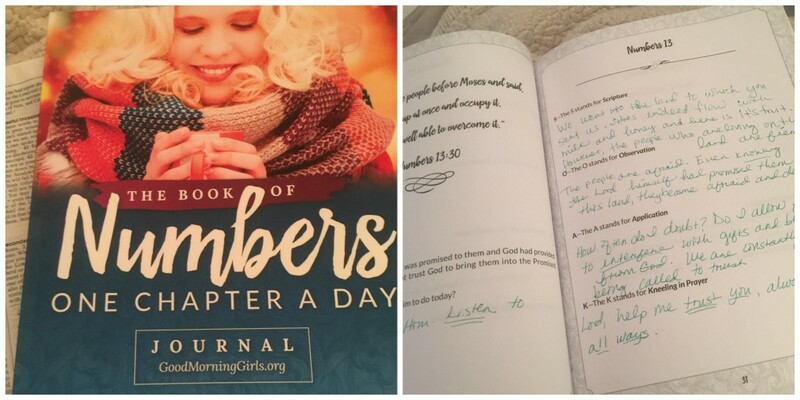 Three weeks ago, I started a free Bible Study called “Good Morning Girls” (which I talked about on episode #028 my podcast “Good Things Radio.” ) I’ve known about this for years because of a friend, Courtney Joseph who began the ministry several years ago. I just always had an excuse as to why I couldn’t do it. I was too busy, it wasn’t a Catholic-specific, I was working on something else, or reading something else. However, the more I looked into it, the more I knew I had to try it. For the last decade, I’ve poured over the daily readings of the liturgical year but I’ve never really studied the Word of God in a formal way and it was long overdue. In the evenings, we re-read the chapter as a family. What surprised me most about this, is that we’ve actually been able to keep up with it. My initial thought of not having any time to fit in a bible study, has not only been proven untrue but I’m finding time for two sessions a day? God is so good! 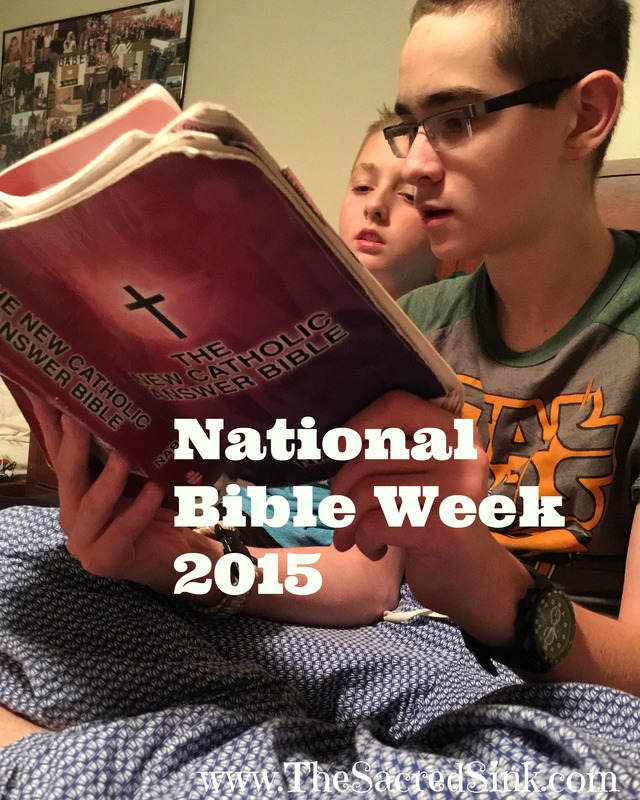 Needless to say, I was excited about the timing of the USCCB’s announcement of National Bible Week and the encouraging words to families about the importance of studying sacred Scripture. The USSCB website has wonderful resources for this week and beyond. Including a contest to test your Bible IQ! Additionally, I also ran across a website launched by the Vatican Congregation for the Clergy, called Biblia Clerus. It allows researchers to access Bible verses with exegesis from doctors of the Church or cross reference liturgical texts with commentaries from Church Fathers. That may be more of the “advanced” level, but it’s worth noting for all the armchair theologians out there! May The Good News of Jesus Christ bless you today and always! We went around the table and wrote the names of the faithful departed. Those (mostly within the last year) that we have loved and lost, and want to remember in a special way. This was surprisingly emotional for me (although I’m always emotional, so that should’t be a surprise! ha). 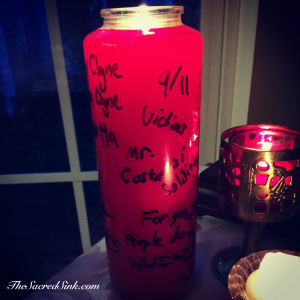 It was a very powerful time of recollection, joy and somber reflection after writing the names of each soul. Anita Kennedy, Mr. Costanzi, Grandpa, Francois, Ruth Howser, Louis Zamperini, Abigail, and many others. That is, every hour he had this man remind him that sometime he would have to die. Each time the man came in before the king, he was reminded that he had one hour less to live; so, each and every time that you hear the clock strike, you should be reminded of the fact that another hour has passed, and that you have one less to live. In this sense every clock has a tongue, and when it strikes it tells us that we will now have one hour less to live upon the earth. I also have my Dad’s memory card from his funeral service (Love that strong smile. Miss you, so much. xoxo). As well as holy cards of the Saints (the Church Triumphant) and a blessing cup chalice. 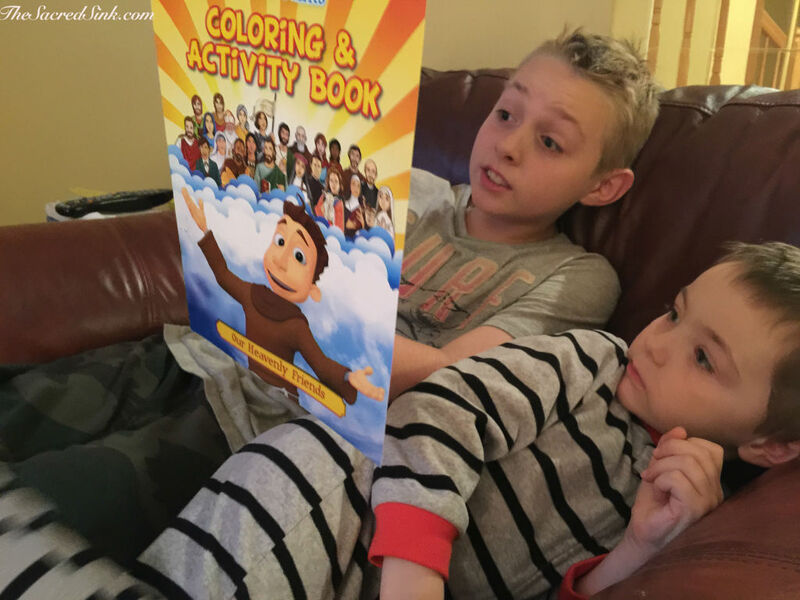 For All Saints Day, I purchased “Brother Francis presents The Saints Coloring and Activity Book” for Mr. Gus (although this is probably better suited for 5-10 year olds). I’m hoping we can get to the cemetery over the weekend and pray the Rosary too. Oddly, it’s one of my favorite things to do as a family (I know that sounded weird, but it’s really not..trust me)! Lol. I love praying for the families as we stop at each grave stone. These are people we will never know this side of heaven, but the Lord hears the prayers and applies grace to the people/families who need it, and I just love that. 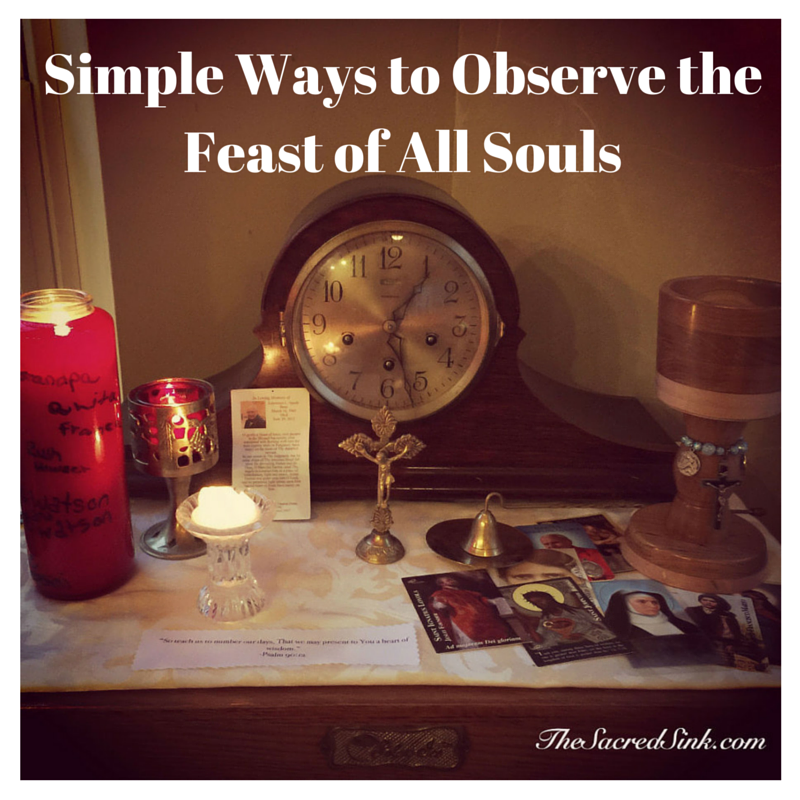 Do you celebrate the Feasts of All Saints and/or All Souls Day? I would love to hear how you observe them! Today the soul is commonly considered to be the totality of the self as a living conscious subject. But what are your thoughts about the soul? One thing for sure, talking about or to your soul would make you more conscious of its invisible mysterious existence. If you care to experiment, the following examples can be a beginning of your own Soul Language Lexicon. Several weeks ago, my spiritual director challenged me to “test the Spirit” about a little flame that had been flickering in my heart. The little flame, was a retreat. 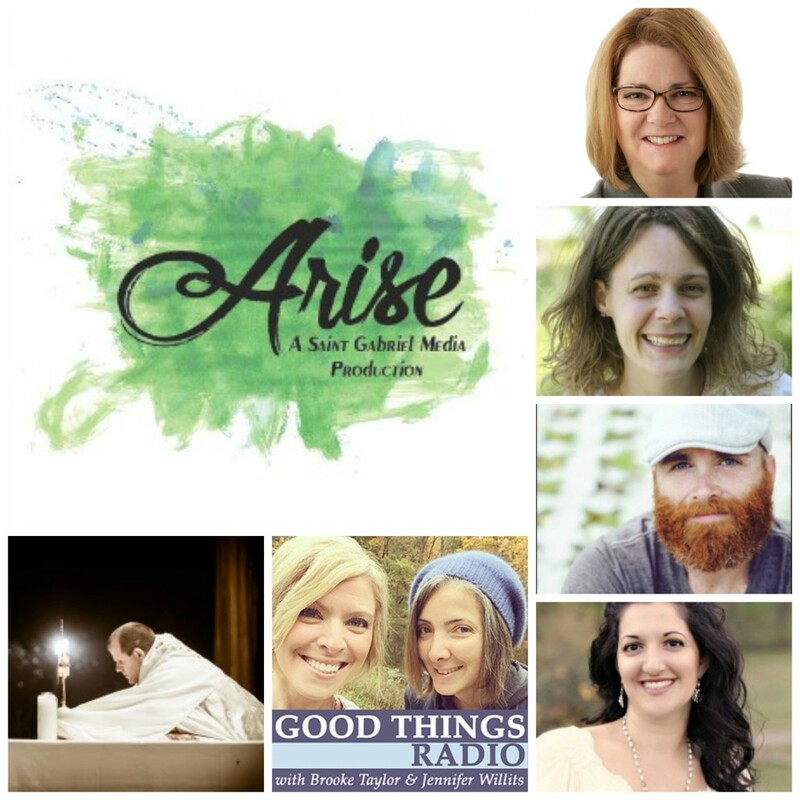 Specifically, a Good Things Radio retreat, which my friend Jennifer and I have dreamed about since our first “Weary Women’s Weekend” getaway in 2012. We didn’t know the “how” or “where” or “when” at the time, but the desire to have a soul-sabattical with other sisters in Christ has remained like a little glowing ember. I have come to learn that when you intend to “test the Spirit…buckle up! Thanks to the blessed wise counsel of this dear priest and the generous support of Walsh University the retreat has come to life! GO Holy Spirit! Jesus, I trust in you! The last year has brought many hills and valleys and I wasn’t sure I had the stamina to take on something like this but now that it’s happening, I am so energized by stories and souls of those who are being called to attend. Last year when Jennifer and I began the podcast, we floated a little “test balloon” to the listeners to ask the question: are you interested in going on a retreat? Would you come? I thought maybe a few hardy souls might reach out (I hoped!) but what we received was an overwhelming response from women in 22 states who expressed interest. That little light is in the hearts of so many others as well, just waiting to be called to this special place. So it is happening and the prayer going forward now is that those who have been summoned will be there to receive the blessing. My mind is so full of details about the actual gathering that it’s hard to know where to begin. I think the most important aspect is to communicate why these weekends are so important. 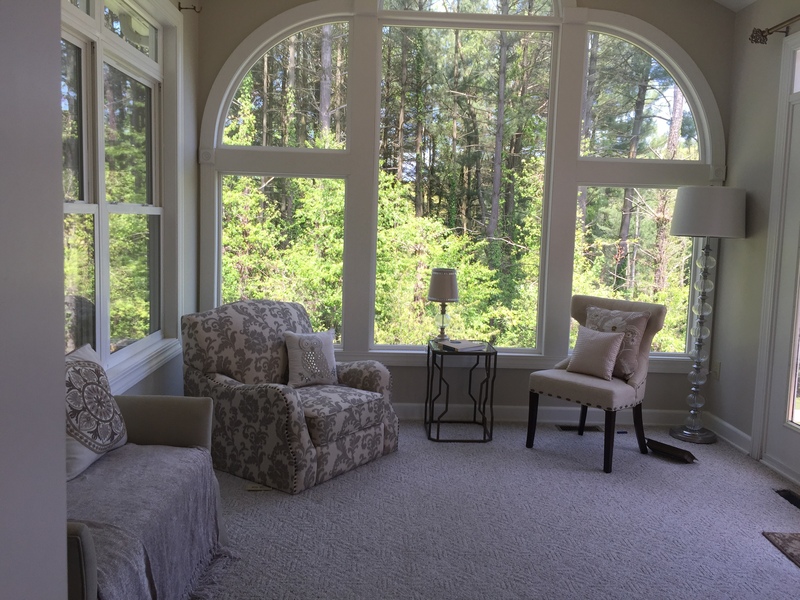 Retreats can have an immeasurable benefit. In Matthew 14:22-23-Our Lord himself receives profound blessings from “retreating” to the mountains. He is tempted; He preaches, He prays, He is transfigured, He speaks his last words to his disciples. In each instance, Jesus comes and remains close to God by retreating, by praying.That is the purpose of a gathering such as this. To slow down our breathing. Pull away from the world and graft ourselves onto HIM. Pray like saints. And enjoy our lives by awakening our souls to the infinite gifts around us. Thursday evening, March 10, through Sunday morning, March 14, 2016. (please listen to GTR episode #24 entitled “Retreating” to find out more about why we chose Thurs-Sunday). Featuring: Fr. Nathan Cromly, Jennifer Willits, Lisa Hendey (founder of Catholicmom.com and author), Sarah Reinhard (author and speaker), Ben Walther (worship leader), Andrea Singarella (craft workshop leader) and most importantly: The Father, the Son and The Holy Spirit. To have an opportunity to “Be Still and know that I Am God.” (Psalms 46:10). To steal away with the Savior in sweet moments of quietude. To enter into the Liturgy of the Hours and draw close enough to His heart to really feel His presence. I love how Fr. Nathan pulls people around him into his prayer life, and that will be the case for this retreat. For those called to join in Holy Mass, and Adoration of the Blessed Sacrament, Reconciliation and more. In working with him to build the itinerary, I was overcome with emotion just thinking about the tender way God cares for us, and anticipating the holy gifts that will be unwrapped during these few days. The ticket includes lodging, all meals unlimited beverages, one-on-one spiritual direction, workshops, presentations and so much more. Pre-sale tickets go on sale for our Good Things Radio listeners on Thursday, October 22 (and if you aren’t a Good Things Radio friend yet, I encourage you to “Like” our page on Facebook) 🙂 We will share the link on the page soon. After that, tickets will go on sale to the public but space is very limited (only 50), so I am just praying that those who are supposed to be there will come. I thank my wonderful priest friend for challenging me to “test the Spirit” even when I was afraid. I hope you will consider testing the Spirit as well! Well hello there! I am so happy to be back after a bit of an unexpected blogging hiatus. I am even happier that you are still here with me. Thank you. The last few months have brought so much change that I hardly know where to begin. The biggest development has been our move. We settled in to our new home about four months ago, about a 10 minute drive from our old neighborhood. The transition has been a little tough, in all honesty. The kids miss their old friends and I miss my old comforts, like our well-loved kitchen and my backyard garden. Our new home is in a quiet neighborhood with heavenly peace and that has been like balm for my introverted soul, but like all things in life, there is the sweet with the sour. Warning. This is not pretty. It was a good thing we had just prayed the rosary or something very different than “Hail Mary” could’ve easily have slipped out of my mouth! The good news….it could’ve been worse. This is just one panel of drywall when you think about it. What we thought at first would be a total loss of carpet in two rooms, a major celling repair, sanitation and painting, ended up being much less than we feared. So many things flowed through my heart that day. The gratitude of the community and so many who prayed for our family. The gift of a sturdy home. Visiting Haiti and Guatemala, I remember seeing an entire home collapse from a typical storm. Leaky roofs and crude stick walls are the reality of so many on the planet. We just had one small hole and soaked carpet. All which can be repaired without much inconvenience. Another new change to our family is the addition of our foreign exchange student, Vivian. 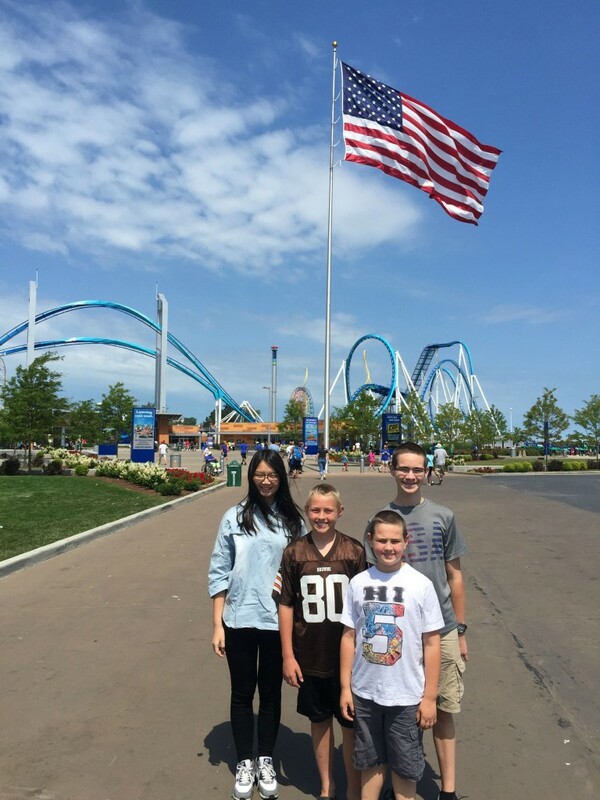 She is from China and attends high school with my oldest son. Her presence in the home as been a wonderful gift and we’ve had many laughs so far, including this! An unforgettable (mis) adventure! 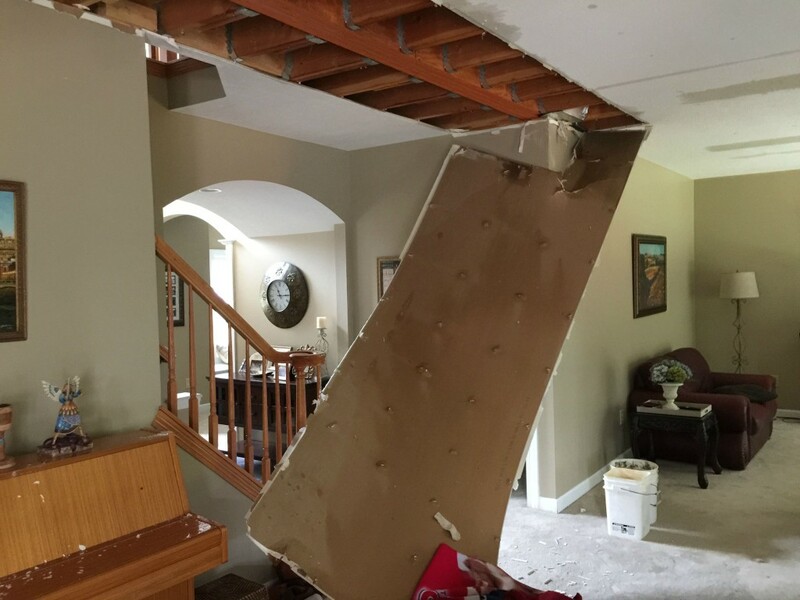 Wherever she goes in her life, she will always remember that crazy day when her American home flooded and the ceiling collapsed! Even with that commode calamity, financial strains, busy kids and balancing schedules, life has been good. So rich with the sweet nectar of God’s grace. Stretching me, pulling me, and pushing me down to my knees at the foot of the cross. I need to be there more. It is there, looking up, that I can see so clearly how He loves me and cares for me when I am unable to do it on my own. He has the answers when I have none. The water that gushes from his side gives rebirth and renewal through the Holy Spirit when I am dry. How can I do anything but rejoice and reach up to embrace his sacred feet? Through times of crisis, he sustains me. This has been the reality and revelation over the last few months that I’ve been going back to. With our lives behind somewhat upended with the move, adjustment, constant flow of home”projects” and the challenge of plugging Karolina into a new county for care and services, it’s been so difficult to get into any sort of rhythm. Prayer or otherwise. That reality has made an already challenging transition, even more difficult. So, the home crisis was almost like a gift, in an odd way. An opportunity to be in the presence of the Lord. For my soul to be disposed to hear His summons. And with that, I feel the summons of my droopy eyelids calling me to rest (at 4:15am)!! I may be a little rusty after so long, but thank you for your grace and patience. If you are interested in a certain theme or topic for my next post, I would be so grateful for your feedback. Do you desire more posts about prayer, meditations and reflections? Do you enjoy the family stories or more of the health/beauty/recipes? Please let me know! And thank you, friend, for journeying with me, even when the sky falls down and the posts aren’t pretty. God bless you. Hello, and happy Spring! Happy Easter! Needless to say, it’s been a complete whirlwind and a ball of emotions as we searched for a new home, went through the loan process and packed up our home of 10 years. With seven people and nearly a decade of stuff, it’s been quite a fun (and lengthy!) walk down memory lane. Don’t you just love it when kids explore “antiques” and laugh at how “old stuff” used to work?! Ha ha. 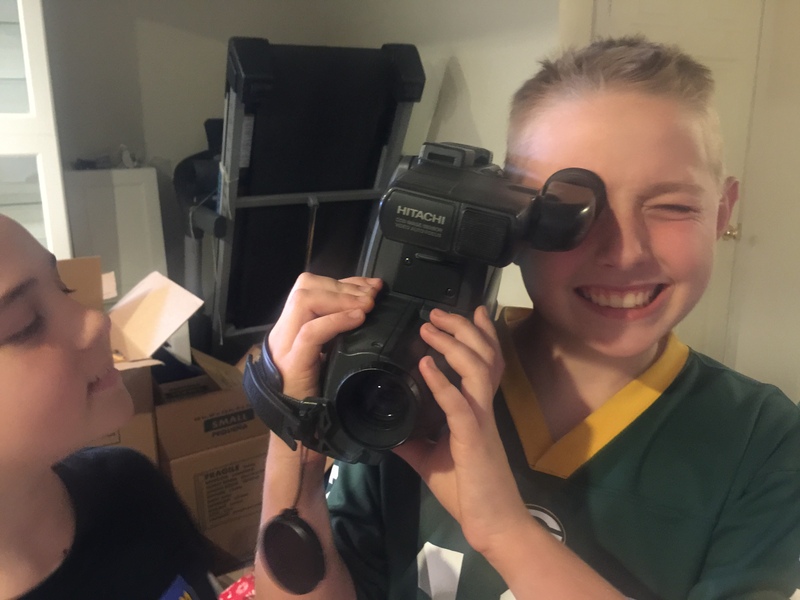 YES KIDS, this is how we used to video tape, in the old days! 🙂 It’s so easy to get sidetracked and get lost in boxes of old memories (okay, I will admit it’s easier for me to do that, than my husband). :) Kudos to Jim for staying on task, while I procrastinate. But all in all, I think we are in good shape to move (tomorrow!) and begin a new chapter of our lives. As I write this, we are hours away from Closing! Thanks be to God! I can’t wait to tell you all about the new house! If you listen to the Good Things Radio podcast, you will know all about it. And if you haven’t listened yet, I hope you will. You can find us in iTunes and also at GoodThingsRadio.com. 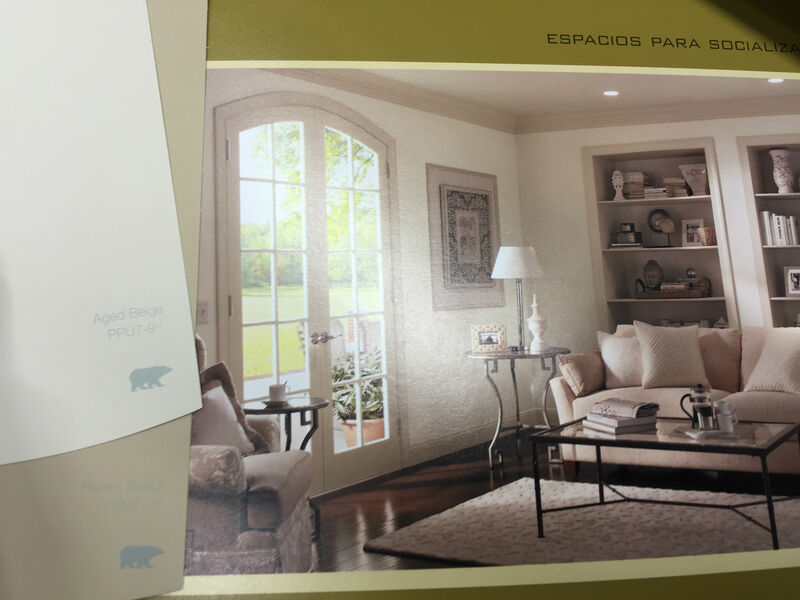 I never knew how many shades of neutral there are out there! I am awful at visualizing things, so I’m just hoping and praying this looks okay. I need to ask for the intercession of Michelangelo on this one I think! Lol. 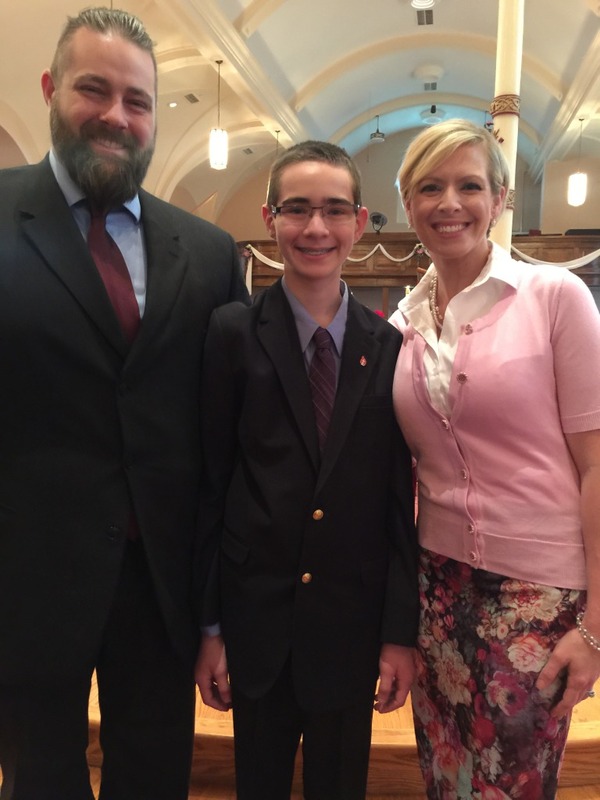 Another big April blessing was Gabriel’s Confirmation. I am so proud of this Godly young man! It was a happy day. We pray the full outpouring of the gifts of the Holy Spirit on all those Confirmed! 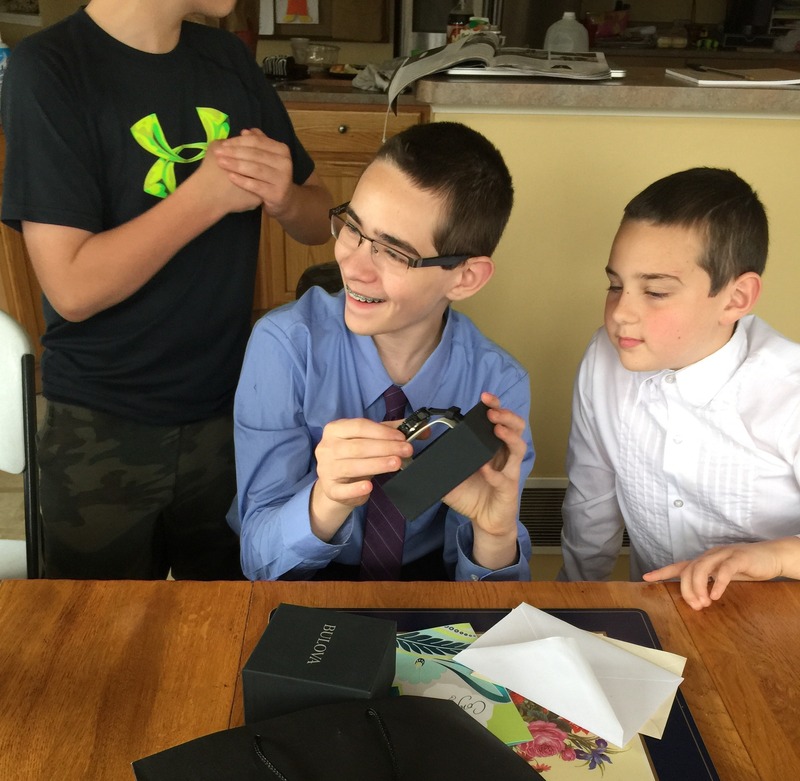 Jim and I thought a long time about what gift we should give Gabe for his Confirmation. He already has so many rosaries, Bibles, holy medals, books and religious items (not that you can have too much), but we wanted it to be something unique and very significant. After much thought, we decided to get him a nice watch. I feel that a good watch is a kind of a “coming of age” gift for a man. Initially I was going to have it engraved with Psalm 90: 12- “Teach us to number our days, so that we may gain a heart of wisdom.” But after brainstorming with my podcast partner Jennifer, she suggested “Be Not Afraid.” Gabe chose St. John Paul II as his Confirmation Saint, and “Be Not Afraid” became somewhat of a theme of JPII’s pontificate. In fact uttered the words three times on October 22, 1978, at the beginning of his pontificate. It is replete with meaning and power and I wrote Gabe a letter with some of the history behind that phrase, so he could better appreciate the significance. Not only is it a call to action in life, but in evangelization and faith as well! 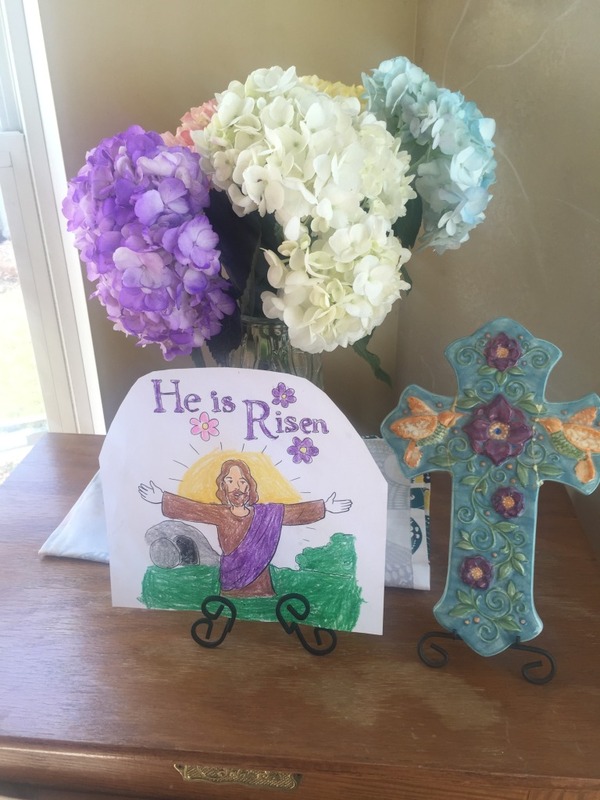 For more ideas about how to make the sacraments special, check out my friend Becky’s article, posted over at Catholic-Link! April has also been a busy month for our podcast, planning a possible retreat, and enjoying some speaking events here in Ohio. 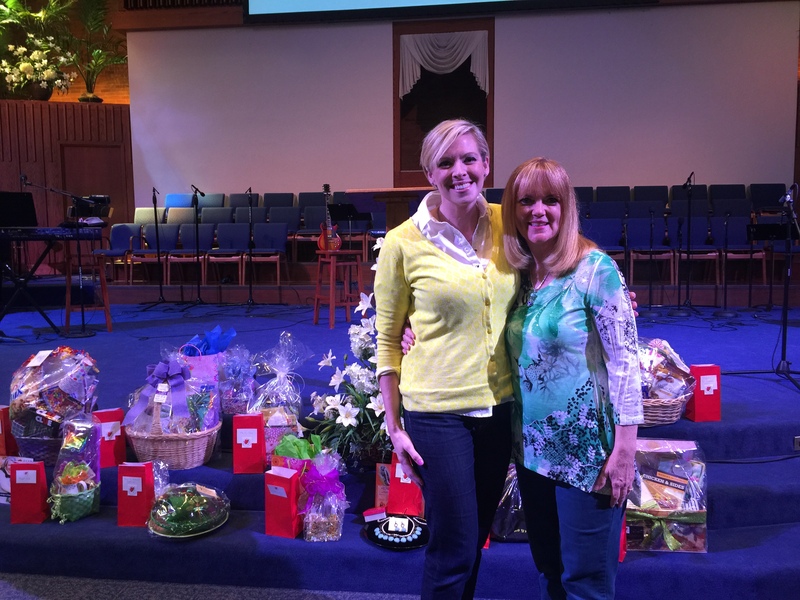 I was blessed to emcee a “Hearts for Heaven” conference with my dear friend, Nora White, as the keynote. What a testimony she has! The speaking ministry has been a gift beyond measure since I left The Fish. It’s such a blessing to still be able to connect with beautiful hearts, even though I’m no longer on a daily radio program. Lord knows, I like to talk! Ha. So I’m grateful to God for allowing me to still serve Him in that way. If you would like to book me for an event, please head over to Saint Gabriel Media. I would love to visit your church or group! 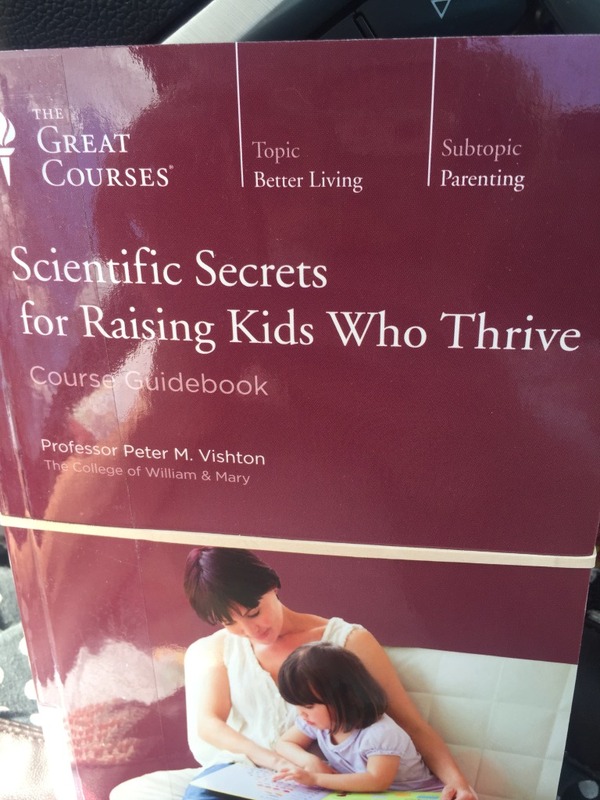 Great for anyone who has kids, or works with kids of any age! Very interesting stuff. In fact, I need to check it out again, just to take notes! 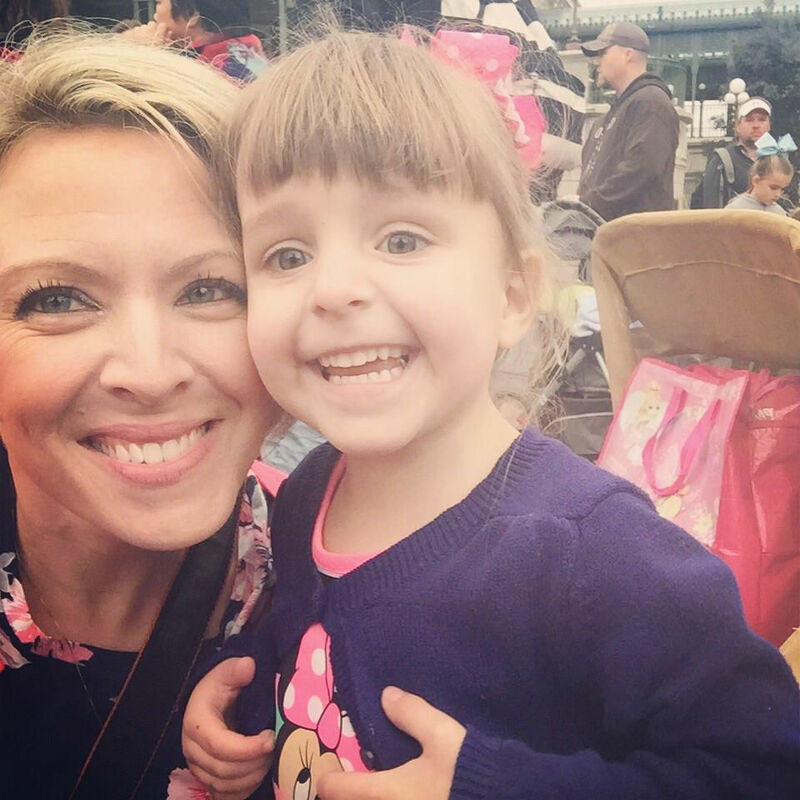 On our last episode of Good Things Radio (Episode #006: Tidal Wave of Emotions”) one of the things Jennifer and I talked about was a recent trip to Florida, and some of the highs and lows from that experience. The “highs” were many! Warm sunshine, visiting family, seeing new places, and no dishes to wash (high-five! :)). God is so good. The giver and source of all good things! But of course, life is filled with light and dark, hills and valleys. For instance, see that picture-perfect scene in photo #1? 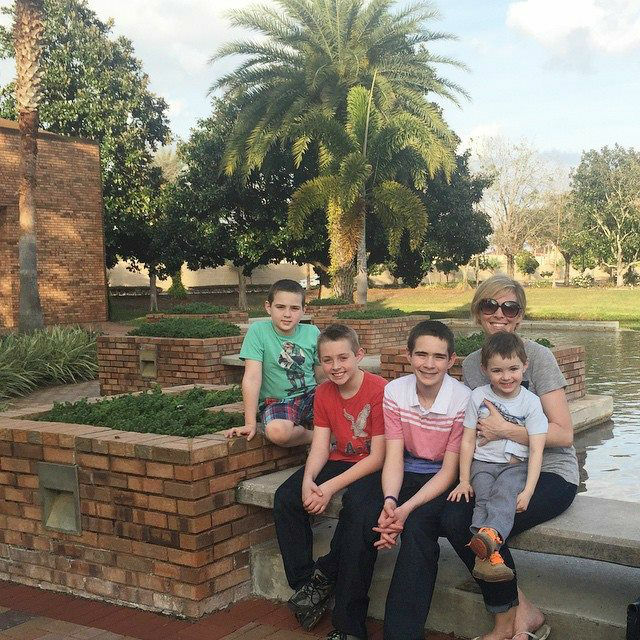 Just moments after that was taken, one of my sons pushed the other into the reflecting pool behind us. Oh, and did I mention we were at a holy shrine?! And my poor, unsuspecting son was fully clothed (then subsequently fully soaked). It was a moment of true parental humility, in every sense of the word! I accepted the claim that it was a complete accident, and my soaked son accepted an apology from his bro. But needless to say, I walked away thinking we could never show our faces in that place again. The silver lining was that my son got some badly needed new summer shoes (since we were far from the hotel and his sneakers were dripping), and I also believe they will always remember visiting that church! Lol. We also struggled with meltdowns (which I described in our Podcast) but in the end, it was another reminder to just “lay it down” at the cross. To do the best I could, then surrender everything else to the Lord. I’m still working on that, but prayers and chocolate help. 🙂 One of the prayers I ran across is called “A Prayer for Hope” by Bernard of Clairvaux. We shared it at the end of our Podcast and I wanted to post it here, for you. I pray you all have a wonderful week. Thank you everyone who has ordered our new CD. Your encouragement and support means more than you know. 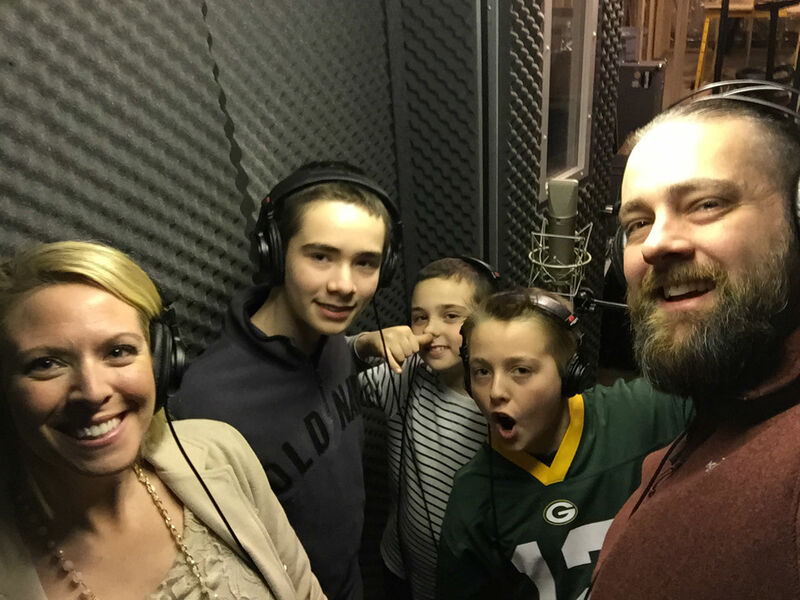 The project was dormant in my heart for many years, and was born out of working at 95.5 The Fish and encountering so many families who simply weren’t quite sure how to “live out” their faith at home and what that is supposed to look like. Having felt the same way myself for many years, I could relate. However, as we slowly incorporated daily prayer into our family life, a transformation began to occur. A spark was ignited! That was the inspiration. This project not only offers some of the most common, traditional Catholic prayers but also the significance, historically and theologically, of why they are important. This allows the listener to enter into a deeper understanding and appreciation of the prayers. It took six months of research, writing, composing original background music (thanks to Mark Coming!) and production, to get to this point. My sincere prayer is that this project will bless and strengthen families and also inspire a deeper personal faith. 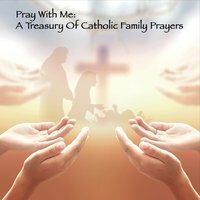 Through my own journey with the Lord and developing a personal relationship with Him, I have come to rely very much on the power of the prayers included in this CD. When you realize the power of the words, it becomes much more than dry recitation, but a proclamation of the heart! The CD has 31 tracks, including brief introductions like, why do we make the Sign of the Cross? The story behind such famous prayers as Hail, Holy Queen and the Nicene Creed. I think my sentimental favorite is the section on Latin. A scholar, I am not, and in truth, these few prayers are about the only Latin I really know…but that’s also what I love about it. It’s simple and accessible for anyone to learn. I also explain “Why Latin?” It’s been the most rewarding aspect of the project so far, because even the few friends who’ve been privy to the “preview” of the project have taken on the task of learning the prayers (and from what I hear, it’s been pretty easy for them)! :) The CD is only $13 and also comes with a 2-page fold out of all the prayers written down so families can read, follow along and learn! The best part for me, personally, was the opportunity to do this project as a family. Please consider this a gift from the heart of our family to the heart of your family. Basket with photo from the Food for the Poor trip to Guatemala (in front). In this basket, we hope to fill (hopefully a few times over) with change for the poor. As we multiply our efforts as a family, our prayer is to offer not only a monetary gift, but prayers for the “least of these” in our own homes and communities, to those around the world. 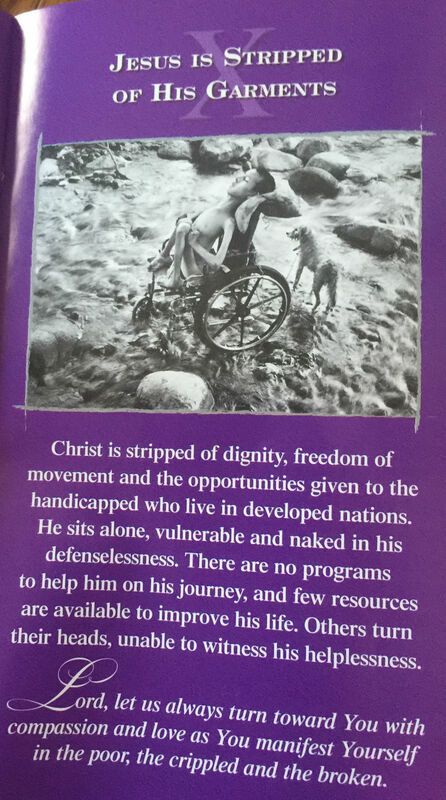 Inside the basket is a very special version of the “Stations of the Cross.” I saw this in the Food for the Poor office in Haiti last year and never forgot the powerful images. They have haunted my heart. In an incredible coincidence (or GOD-incidence) I was going through two bags of prayer books and holy cards today…from a friend who gave them to me after her mother died (they were the mothers’). In the midst of probably 100 items, was THE SAME Food for the Poor “Stations of the Cross” from a mailing she received in 2007! A Lenten gift from the Lord! I remember starting at this image and trying not to outright sob, standing in the FFTP office in Haiti. To see the picture framed and blown up in size (along with the caption) was an experience of profound emotion. These visuals are a powerful way to enter into the Passion, death and Resurrection of Christ. I pray it will be a source of contemplation for our family too, as we pray the Stations on Friday’s during Lent. You can order or download the exact set here. Next on the mantle is a twig and twine wreath that I brought at Michael’s for just a few dollars. I added toothpicks to create a “Crown of Thorns.” Grant created this “IRNI” banner. It’s an abbreviation for: “Iesus Nazarenus, Rex Iudaeorum” (“Jesus the Nazarene, King of the Jews”). The sign was nailed on the cross and meant to humiliate Jesus (along with the “crown.”). This reminds us of the power of God’s sacrifice. By his stripes, we are healed (-Isaiah 53: 4-5). Lent is time of dying to the things of this world, cutting away the things that tempt us, tie us down, and keep us from Christ. Hopefully these sobering symbols will enkindle a revolution of the heart. The pitcher is a reminder of Jesus-healer and servant-Savior (John 13: 1-7). The nail, hangs from the tree. (Here in the United States, we receive ashes traced in the sign of the cross, on our forehead. 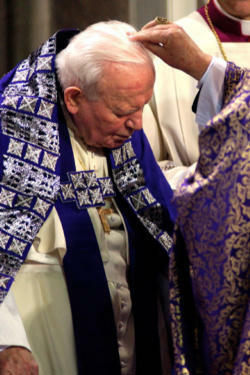 When my husband and I were in Rome for Ash Wednesday several years ago however, the ashes were sprinkled on the top of our head (as Saint JP II is receiving)). We learned that sprinkling ashes on the crown of the head recalls the biblical method of putting on sackcloth and ashes as a sign of penance. 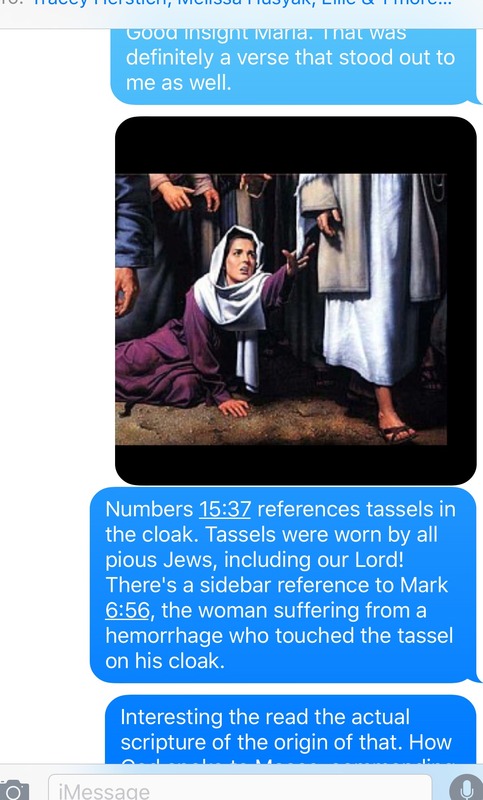 “It probably derives from a custom, noted in Germany from the ninth century, of extending a large cloth before the altar from the beginning of Lent. This cloth, called the ‘Hungertuch’ (hunger cloth), hid the altar entirely from the faithful during Lent and was not removed until during the reading of the Passion on Holy Wednesday at the words ‘the veil of the temple was rent in two.” (you can read more about that, here). Although these mantle symbols may seem intense, heavy, and sorrowful, they are mere reminders of the power of the season..not the state of our hearts! As a family, we have a “teamwork” mentality as we condition our hearts and minds in preparation of Easter, but that doesn’t mean joy is absent. 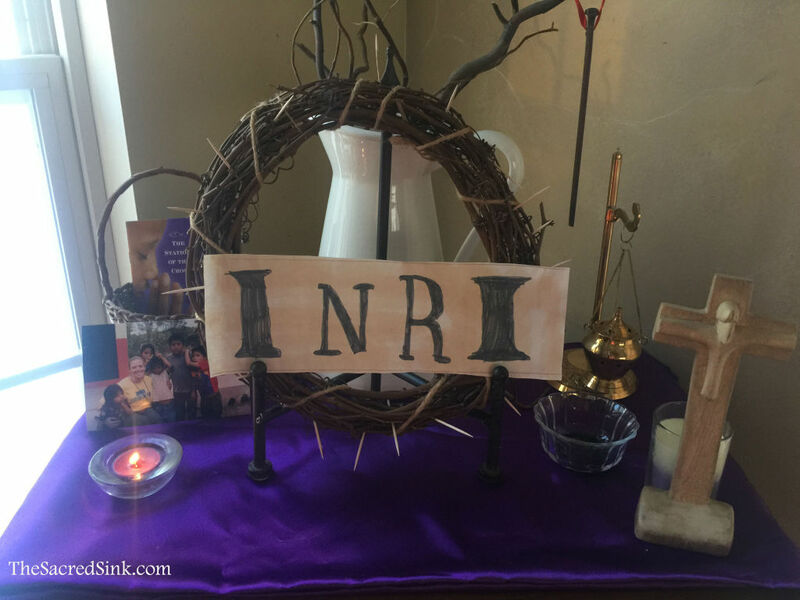 Lent is such a great reminder of how GREAT our God is…His faithfulness, His love…His mercy! For wonderful resources and creative ideas, check out “The Kennedy Adventures” blog (Dianna is amazing)! I wish you a prayerful, joyful, holy journey with the Lord this year! God bless you during Lent, 2015, and always.